Dust settles gently around here. Sometimes I think the driving tension here isn’t between characters or social classes, but between expectations and reality. Snow White delights in driving down a road we recognize only to turn onto a side street at the last moment. After a heavily foreshadowed build-up, Shirayuki and her father’s reunion winds up pleasant but distant. There are no tearful embraces, no explosions of anger, no painful choices about whether Shirayuki will stay or leave. But, really, why would there be? Snow White doesn’t believe anything is determined by the accident of one’s birth. To Shirayuki, people are defined by their lives, not their roles. Princes aren’t guaranteed respect and fealty, and commoners have as much right as royalty to pursue and even demand happiness. Similarly, family is about shared experiences and affection, and home is the place where one feels safe and comfortable. It has nothing to do with blood or birth. So of course Shirayuki would immediately turn down Kazuki’s offer to stay with the Lions. 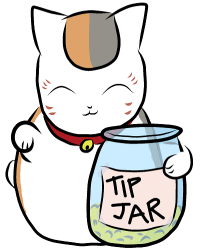 Clarines is her home. She made that clear a long time ago. That isn’t to say Shirayuki hates her father or that Mufasakaze is a Jerk Dad. He’s actually a pretty great twist on the standard anime parent, best shown when he snaps at Zen like a stereotypical controlling father and then goes “Nah, I’m just screwing with you, Shirayuki’s free to make her own choices” (summing up Snow White‘s central theme rather succinctly, in fact). He’s also proof that you can be an absent parent without necessarily being a selfish or cruel one: He left his daughter for her own safety and made sure she was raised by people who loved her; he worried when she left Tanbarun and was prepared to help her if needed (not realizing Kazuki would be as forceful as he was about it); and now that he knows she’s safe and happy he’s content to let her lead the life she wants. A parent should act in a way that’s best for their child. Present or no, I think Mukaze tried to do just that, which is why Shirayuki has no hard feelings even if she doesn’t have particularly warm ones, either. With that non-confrontation out of the way with hilariously unexpected ease, the rest of the episode is loosely divided into three parts as Shirayuki interacts with the main relationships of this arc: Obi, Zen, and Raj. This season could have easily spiraled into a convoluted mess of a love quadrangle, but Snow White forgoes a standard harem-style romance to instead portray three intimate, important, but very different relationships. As I gushed about on Twitter, I spent a lot of this week salivating over background art and color palettes, because in addition to looking absolutely freaking gorgeous, they set and change the tone from one scene to the next, informing these relationships as much visually as they do verbally. To start, Shirayuki and Obi meet, head-on and face-to-face, outside of town in a murky forest that matches Obi’s dark, earthy color scheme. It reflects on his own wilder, more aggressive nature, and perhaps suggests that their relationship is harder to define than the “official” ones with Zen and Raj that we later see in towns and palaces (or just reflects their “down-to-earth” status as commoners). 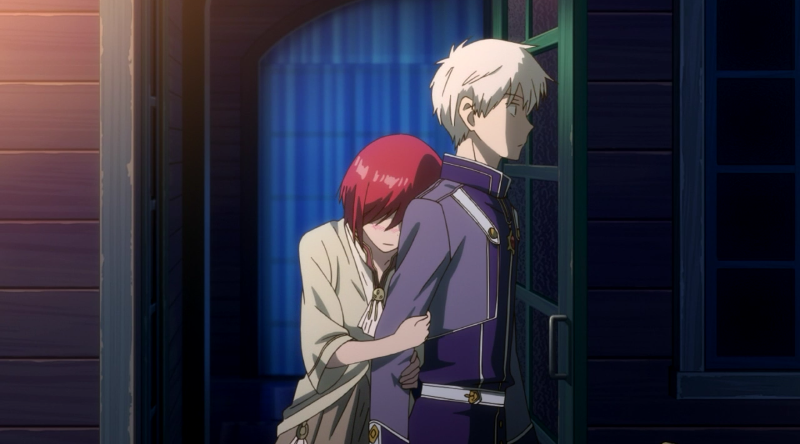 It’s also rather gloomy, like Obi himself, who apologizes to Shirayuki for failing to protect her. Shirayuki doesn’t blame him, but when he insists on holding himself accountable, she wisely doesn’t fight it. Sometimes forgiveness isn’t about the “wronged” party, but about the guilt of the one who thinks they’ve done wrong. By accepting his apology and giving him a second chance (“come with me next time”), she acknowledges his feelings as valid even if she doesn’t agree or fully understand them. Shirayuki gives Obi what he needs, allowing him to feel that he can stand beside her again. Then we have Shirayuki and Zen, cloaked in Zen’s own cool color palette of soft blues and whites. They meet in town, but in a private, closed-off room rather than out in the open, granting them a cozy space that belongs only to them. Their presence is a comfort to the other, and their scenes have an almost ethereal quality, as if they really are transported to their own separate world when they’re together. This is also the only relationship where Shirayuki not only considers her own needs, but lets them take precedence. Still rattled by recent events and comfortable with Zen in a way she isn’t with others (even if she still can’t quite bring herself to drop that “L”-bomb like he did), she lets herself be a little vulnerable and selfish, leaning on him for support. It’s also a lovely parallel of the last late-night bedroom scene they had, only this time it’s Shirayuki embracing Zen rather than vice versa. Finally, we have the real star of this arc: Prince Raj, who wraps up his transformation from beast to man by meeting Shirayuki on the dance floor, person to person, and moving with her rather than trying to control her. Their scenes are characterized by cheerful pinks and golds and occur in public spaces, surrounded by others and marked by social ceremony. There’s a lot of optimism here, but also less intimacy than Obi or Zen were given. Despite Rona’s assumptions and Zen’s low-key jealousy (although he’s still happy to see Shirayuki happy, the little darling), the visual cues all point to a relationship of colleagues or new friends rather than a budding romance, one-sided or otherwise. Her special attack is the Expecting Better Of You Stare. It’s a one-hit KO. And that’s fantastic, particularly given where Raj was when we first met him, treating his subjects like toys. Having him fall in love with Shirayuki would have been boring, not to mention undercut the entire point of his arc. This needed to be the story of a self-centered prig learning how to respect and listen to others, not “so a woman will like me back” but because he comes to realize it’s the right thing to do. And, thanks to Shirayuki holding him accountable for his actions rather than acquiescing because of his noble birth, Raj steps up to her challenge and does just that. The prince (and man) who once tried to force his will onto a commoner (and woman) now not only accepts Shirayuki’s agency but actively encourages it, saying that it would be “boring” otherwise, and his request to see her long hair if/when she grows it out again serves as a direct parallel of his original demand that she be presented to him like an object instead of a person. Shirayuki acknowledges his growth by inviting him to visit Clarines “as a friend” (much to Raj’s adorable delight), and the curtain officially closes on our Tanbarun tale. So what’s next? With just four episodes left, one would suspect a concluding arc with our Final Boss, Izana. Will he say Shirayuki passed or failed this test? How will ShiraZen react to his judgment? And in a story about the importance of fighting for one’s right to choose, do they really need Izana’s “blessing” at all? But, hey, this is all just speculation based on preconceived narrative expectations. And if Snow White has taught me anything, it’s that expectations are meant to be thwarted. 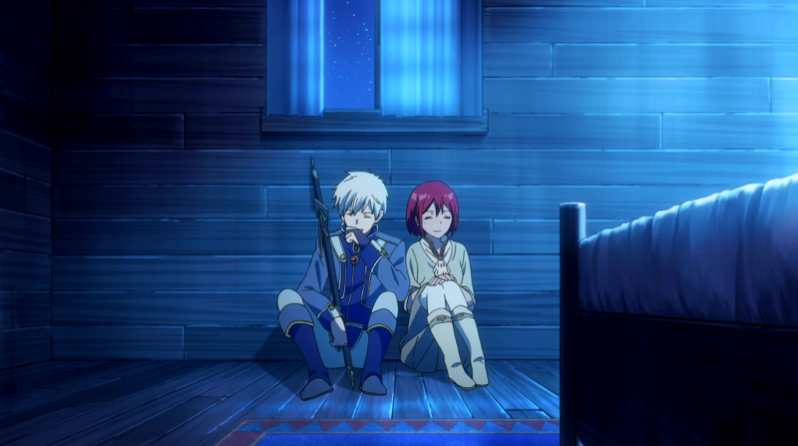 Dangit, Shirayuki, stop falling asleep right when Zen is about to tell you something important! I have a long, eyebrow-twitchy relationship with the “romantic” trope of the unconscious (read: non-consensual) kiss, and I’d have much preferred it if Zen had gone for the forehead instead of the lips, but… well, this one didn’t aggravate me as much as usual, I suppose because it struck me as a comforting good-night kiss in the way a parent might peck you on the cheek rather than someone taking advantage of another person to serve themselves. I’ll very much understand if it bothered others more than it did me, though. Also great this week: The blocking. Obi and Raj both face Shirayuki head-on, highlighting the confrontational/challenging nature of these interactions, while she and Zen are frequently facing the same direction, side-by-side as cooperative partners. Every time a Raj snaps, an angel gets its wings. Ah, I meant to mention MitsuKiki in the bullet points and totally forgot! Their scene together was adorable. I think I kinda ‘ship ’em now. Kazuki acted like an idiot, but he’s young, has survived some horrific events, and his heart was in the right place. His apology was sincere. I think the others recognized that. Plus he *did* spend most of an episode getting knocked around and tortured by Umihebi. I’d say that’s punishment enough for the poor kid. I honestly would have preferred that kiss to be on the cheek or forehead as well (Zen certainly isn’t creepy or skeevy, but that entire trope is), but I wasn’t quiiite as bothered as I normally would have been. Mostly I think because their relationship is already pretty firmly established in both their minds, and because they’ve already been that physically at least a couple of times before. That still didn’t make it okay, but it did go a long way to making it a more tolerable watch for me. Yeah, with scenes like that, a lot of the times I just have to put myself in the character’s place. If I was in a committed relationship with someone, would I be upset if they gave me a little good-night kiss after I fell asleep? I don’t think so. I think I’d find it kinda sweet. But again, everyone’s boundaries are in different places, so I’ll totally understand if others were really uncomfortable or bothered by it. Another beautifully written Akagami review! Your episode reviews keep on giving so much more insight on character depth and visual themes of the series. I always find something new to appreciate the Akagami for, given that I’ve already read the manga and am just here to melt away in feels yet again. I believe my favorite thing about Akagami is its ability to handle relationships (and the issues thereof) with such comfort and ease, while still being able to get more depth out of it than if it were more conventionally (melo)dramatic and conflicting. Watching everything unfold cleanly is surprisingly refreshing rather than boring, something the show seems to pull off effortlessly. I kind of agree with you when it came to the ‘goodnight kiss’ scene. It only really occurred to me afterwards that no, Shirayuki was not conscious at that time, and really raises the question of consent, especially coming from a guy who’s shown to be very particular about the topic. But it still just felt like a goodnight kiss, and nothing more than that (other than the squeeing!). Not sure if that’s good or bad, or neither. Also, you might not remember this, since it was eons ago from episode 7, but the first time Raj and Shirayuki formally part, after she asks him to become a prince she can be proud of, he had Sakaki bow and pay respect for him (even though she wasn’t really present either). This time, he sincerely does the bowing himself, another tiny nod to the completion of his character development arc. Oh, I forgot about the bow! I figured there was more significance to that than just Raj showing respect, but I couldn’t think of what. That’s a fantastic parallel! This show is so great at remembering past events and building on them to give its characters small but significant moments like that. I’m going to really enjoy the eventual rewatch, aren’t I? It’s great to hear that manga readers are enjoying the anime (and these reviews, too!). Sometimes adaptations really struggle with that balance between source-material faithfulness and necessary medium changes, which can cause dissatisfaction, but it sounds like Snow White has been a wonderful experience for manga-readers and anime-only viewers alike.